10" LP - Gatefold cover - Klappcover - 8 tracks - 21:08min. 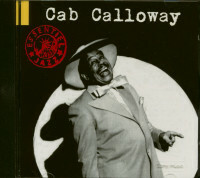 Minnie The Moocher was effervescent bandleader Cab Calloway's signature theme for more than half a century. He first waxed the ditty in 1931, and his sparkling reprise in the 1980 film 'The Blues Brothers' was one of its indelible highlights. Arthur Shimkin's BELL RECORDS was no doubt delighted to bring Cab aboard in 1954. The New York-based label special- ized in soundalike versions of current hits at bargain list prices, but no way would Cab's leonine roar ever be mistaken for that of anyone else. 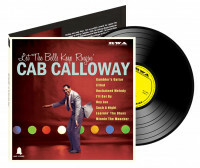 The eight songs Calloway waxed for BELL con- stitute this 10-inch LP, and there are some real surprises: Cab dives into Carl Smith's country romp Hey Joe and Teresa Brewer's perky Jilted as though they were conceived for him (ditto Jim Lowe's dramatic Gambler's Guitar and the majestic Unchained Melody). Even Clyde McPhatter and the Drifters' steamy R&B smash Such A Night and Frank Sinatra's suave Learnin' The Blues were fair game for Calloway's singular pipes – and he served up a fresh, invigorating version of Minnie The Moocher for BELL's fast-growing catalog. With Jimmy Carroll leading the orchestra and The Four Bells adding occasional backing vocals, Calloway's brief but memorable 1954-55 stint at BELL is commemorated with this delightful collection. 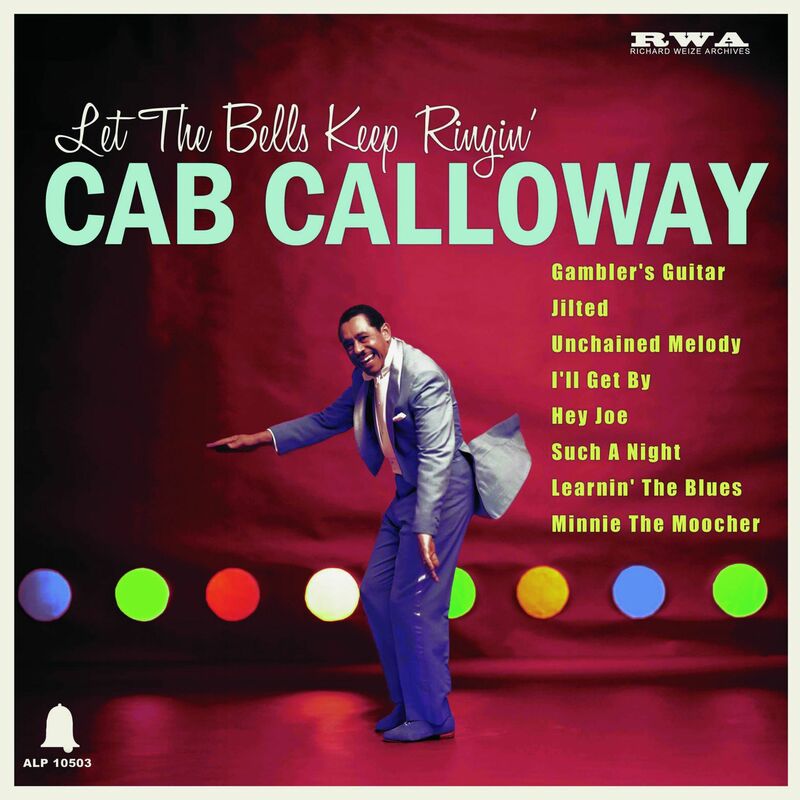 Thanks to New York’s budget-priced Bell Records, veteran orchestra leader Cab Calloway wrapped his rafter-rattling pipes around some of the biggest selling songs of the mid-1950s. The label’s business model was an intriguing one. Arthur Shimkin launched it in 1952 as an offshoot of Golden Records, which he’d established four years earlier. Both were financially backed by New York’s Simon and Schuster publishing company. Shimkin covered the hits of the day with competent singers and musicians both famous and unknown, packaged Bell’s singles in colorful picture sleeves, priced them at 39 cents each, and sold them in grocery stores, bookstores, and other outside-the-box outlets. The concept clicked. Calloway’s endlessly swinging orchestra had been a national sensation during the 1930s and ‘40s that obliterated racial barriers with its musical innovations and dazzling showmanship. His roaring pipes, elastic dance moves, and wild zoot-suited attire made him the epitome of pre-war hep. He appeared in mainstream movies, led his orchestra on network radio, and headlined the finest venues. But hits grew scarce for Cab by the late ‘40s. By 1954 they’d dried up. Cabell Calloway III wasn’t the first member of his family to take the show biz plunge. That honor went to older sister Blanche, a pianist who recorded with Louis Armstrong in 1925 (much later, she managed singer Ruth Brown). Cab was born Christmas Day of 1907 in Rochester, N.Y. and was raised in Baltimore from age six. His middle-class family had high hopes of him becoming a lawyer, but Calloway had other plans. He met up with Blanche in Chicago in 1927 and began singing professionally. 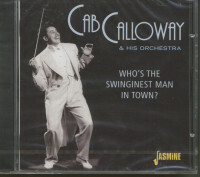 Cab led an 11-piece orchestra, the Alabamians, but when they lost a 1929 battle of the bands at New York’s Savoy Ballroom, he quit. Broadway manager Irving Mills teamed Cab with another outfit, the Missourians. Mills snagged the band an engagement at Harlem’s famed Cotton Club, and Calloway was on his way. He settled into the swinging nightclub in 1930 for an extended engagement that lasted for years. Performing for well-heeled Caucasians, Cab unleashed his huge voice and wielded a mean baton, whirling, dancing, singing, and mugging his way to stardom. He made his recording debut that year and scored a hit with an outrageous rendition of W.C. Handy’s St. Louis Blues. 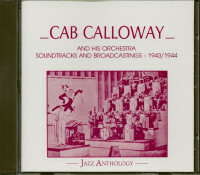 In 1931, Calloway and his band skyrocketed with the number that would become his lifelong theme. Minnie The Moocher featured a surreal storyline, a slinky groove, and a "hi-de-ho" singalong chorus (his penchant for scatting had commenced when he forgot some lyrics during a show and had to improvise). Cab’s treatment of the minor-key moaner St. James Infirmary was also popular, his ebullient vocal delivery ensuring the mood didn’t grow too morose. Calloway’s vibrancy was tailor-made for the silver screen. He performed Minnie The Moocher in the 1932 romantic comedy ‘The Big Broadcast’ and led his outfit through a torrid Reefer Man the next year in ‘International House.’ Cab even turned up in a handful of early ‘30s Betty Boop cartoons. 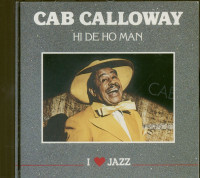 In 1937 Calloway and his orchestra were featured in their own nine-minute short ‘Hi-De-Ho.’ He co-starred as a hepster in the 1943 big-budget musical ‘Stormy Weather’ and headlined his own full-length ‘47 film, also titled ‘Hi De Ho.’ Working all the angles, Cab penned ‘The Hepster’s Dictionary’ in 1938 (updated in several later editions), providing a handy glossary of cool cat lingo for his legion of followers. Customer evaluation for "Let The Bells Keep Ringin' (10inch LP)"